Prominent & Leading Exporter from Chennai, we offer my funtime book of activities- vol-1, my funtime book of activities- vol-2, my funtime book of activities- vol-3 and my funtime book of activities- vol-4. 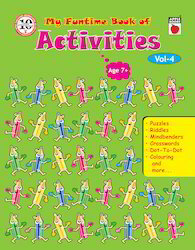 My Fun time Book Of Activities- Vol-1 offeredcomes in quality 32 page softbound finish featuring puzzles, riddles, mindbenders, crosswords, dot-to-dot, coloring and more interesting interactive lessons. Being suitable for children of 7+ years of age, these books are amongst the best tools for engaging child's interest on a variety of themes. Providing a strong foundation for kid's learning needs, these are suitable for personal as well as for school classroom teaching. 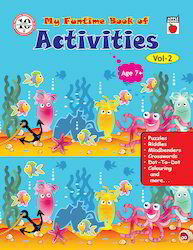 My Fun time Book Of Activities- Vol-2 offeredis a book that is suited for children of 7+ years of age and includes puzzles, riddles, mindbenders, crosswords, dot-to-dot, coloring and more. Made available in 32 page softbound finish, it is a perfect learning aid with its interactive layout making learning all the more enjoyable. The interactive learning approach also supports students in self handling of tasks through use of interesting instructional approach. 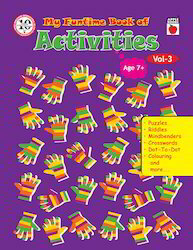 My Fun time Book Of Activities- Vol-3 offered comprises puzzles, riddles, mindbenders, crosswords, dot-to-dot, coloring and more and is suitable for children of 7+ years of age. Coming in 32 page softbound finish, the book is an ideal learning material and a suitable option for fun time activity. Coming in high printable quality, it is perfect choice for introducing children to different lessons with the interactive book layout teaching children how to do coloring and other enjoyable activities. 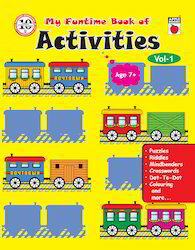 Looking for My Funtime Book of Activities ?